Do you prefer to stand or sit for playing ? I have tried to play standing up and it was a disaster. However, I think the sound of the violin was better. A soloist stands and everyone else sits but I can hear the soloist versus a 40 (?) piece orchestra ? Although still very much a beginner, my preference is to stand for "actual performance". During practice, I'll sit, figure out the tune, play with different "action" and timings (yes, I know, the sheet tells me what and (largely) how I should play - but I'm not quite up-to-speed on sight-reading yet and anyway - I just enjoy experimenting, improvising, and generally breaking / exploring the rules! ). And yes - there are other pieces of course that simply don't lend themselves to such acrobatics - and I'll just stand in a well balanced position. Anyway - that's what I find - I'm happy sitting or standing - but for "final takes" ( or indeed a live performance were I to do one, either solo or in a group ) I would prefer to stand ! It's interesting that you say that when you stand, it sounds better - in what way, I wonder? Are you subconsciously experiencing what I (tried) to describe - are you somehow imparting improved "expression" into the piece with the improved overall "freedom of movement" of your body? I don't know... just bouncing thoughts around! When sitting I seem to be more focused. When standing I have a tendency to jump around a lot. I do both sit and stand. Seems when I am trying to concentrate on learning a particular technique I more often sit. Bill adds that his "list of things to experiment with"
I usually stand when I play violin/fiddle, since I move and walk around a bit when I play. I find it helps for avoiding tensing up, and it just seems to me that it helps the flow of the music some. I do have one exercise that requires playing seated though. You sit in an armchair, rest your left elbow on the arm-rest, so that you aren't really using any effort to hold up the instrument. Then play a song or two while leaving your bow hand upper arm resting against your body, so you bow using only a bit of forearm and mostly wrist and fingers. It was suggested to me to break the habit of the bow hand being too rigid and having too much of a "death grip" on the bow. I think it does help a bit for that. 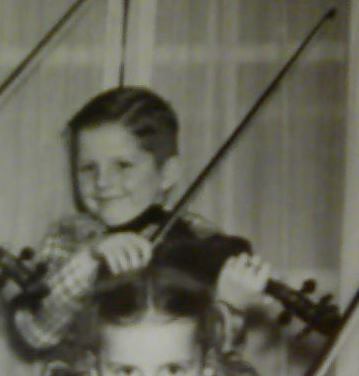 But usually prefer to play violin/fiddle standing and more often walking around. Standing still while playing, I don't think I'm real good at. It just feels too unnatural to me to stay in one place for any length of time when playing. I do both, too, though I prefer to stand and often walk around while playing. I especially like to walk around when running through tunes from memory. It seems to help me focus mentally if I give the rest of my body something else to do while it's waiting. When I sit, I prefer to sit on a high stool so that my bowing arm can move freely without running into my leg on E string notes. Just between me and all of you, and I don't advise this, I've been known to practice while watching tv too. There are special things I learn on this forum that I've never seen anywhere else! But I did read another report about piano practicing. It was about a virtuoso (Rubenstein?) who had to have a handy fresh box of chocolates on the piano when he practiced. I like this approach. Good excuse for some chocolate peanut butter eggs. LOL, Pierre, it's the only way I practice, is while watching TV,, the ball game, movies, news, etc.. I always sit in my recliner, although I don't recline while playing, I sit on the edge of the chair. I brought this up in the chat box last evening that for some reason my violin seems to sound better at 2:00 or 3:00 am in the morning. How come ? What happens if you sit down ? My neighbor's sleep with cpap (breathing) machine's on at night, they can't hear anything and there's 30' between my house and their's and both home's have 6" insulated wall's. They can't even hear me if they're on the deck. I prefer to play standing up. I seem to keep in proper position. I'm also able to play my E string better when I stand. It becomes uncomfortable and boring.